Hello third trimester, we meet again. It feels bizarre to be in the third trimester of my second pregnancy considering how the last few months have flown by. Toddlers keep you busy, and the symptoms and worries and stresses that came with #1 have disappeared with #2. I’m not up all night reading about how to birth a baby… or googling what I need to add to my baby registry. I don’t wake up in the middle of the night and feel them kicking, honestly I’m so tired I sleep through them now. There isn’t a big question mark hanging over my head about how my life will change in a few months, It’s changed… it’s different, and I love the new normal. Experiencing my second pregnancy has been wonderful considering I’ve actually been able to enjoy it. Despite the symptoms and uncomfortableness that comes with having a baby, I have been able to better put the stress aside and simple be grateful for the life forming inside me. I’m excited because I know what’s to come. 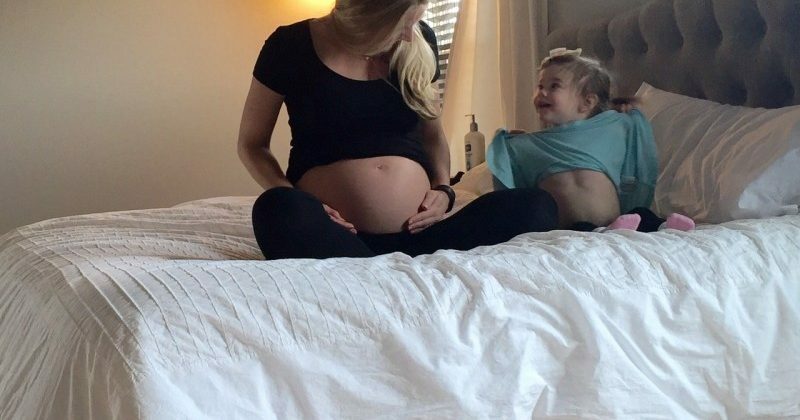 OK, so I’m not excited for the hormones post pregnancy, and the sleepless nights, and the crying…. but I also know that this passes quickly. I’m excited because I get to experience another first smile and baby giggle. I get to have a baby sleep on my chest and watch those incredible first steps again. These moments with Lottie I cherished, but I don’t think I fully understood the importance of not rushing them. Lottie moves at a million miles a minute and I was daily trying to keep up. My life isn’t slowing down, but I know now how quickly the months go, with every day a new milestone passing you by. I can’t wait to experience all of these again. Before I get too uncomfortable and deep into my third trimester Josh and I are getting away together. We have a quick babymoon coming up this weekend in Nashville. The plan while we are there? Eat and Sleep… with a focus on the sleep. Even for two days to sleep in and wake up slowly and get coffee in peace sounds luxurious. It’s funny for the first babymoon we jetseted to the Bahamas and spent two weeks between a resort and a cruise. Now for us to find 2 days to getaway is a huge success. Like I mentioned earlier it’s our new normal. What I’m most looking forward to this week: This coming weekend we are headed to Nashville. I’m excited to have 3 days for just Josh and I to connect. We are leaving Lottie at home with Papi and it is a blessing to not have to worry knowing she is going to be spoiled and having so much fun every minute we are gone. Finally, entering my third trimester it’s starting to feel real! Workouts: Rowing and Weights. I miss running and am ready for Spring/Summer more than ever. I want to get outside with Bob and get back to our daily runs! Movement: I’m definitely feeling this baby less, mostly because I think I don’t slow down all day. Lottie has me on the go so I don’t have the downtime I did with #1 to sit and enjoy the flips. I know as baby gets bigger and stronger the kicks will be hard to miss, but as of today the movement is mostly at night before I go to bed when I am finally able to sit on the couch for more than 15 minutes.